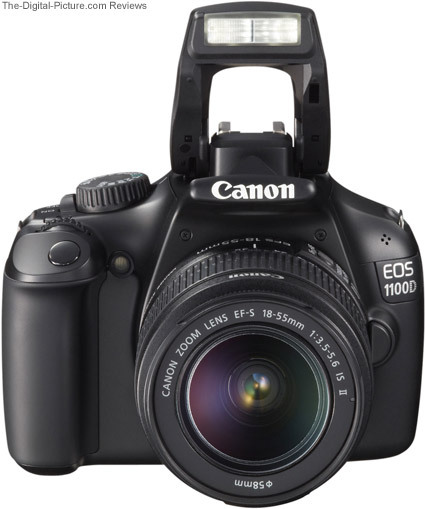 Note: The Canon EOS Rebel T3 / 1100D has been replaced by the Canon EOS Rebel T5 / 1200D. The Canon T3/1100D entered life as an entry-level DSLR with basic features including an entry-level basic feature that everyone can love - a low price. That feature, low price, is indeed the primary reason to buy this DSLR over the rest of the Canon EOS DSLRs - including the announced at the same time and similar-sized (but far more feature-filled) Canon EOS Rebel T3i / 600D. This review suffered an early setback - I lost the battery charger. Never before have I lost a charger or power supply - for anything. And I have no idea where the charger went. After searching and thinking for a few days, I opted to replace it with a new one. Have you ever tried to replace a battery charger for a brand new camera battery model just after a disaster has occurred in Japan? With a replacement LC-10 Battery Charger in hand, this review once again moves forward. "Canon is happy to introduce a chic camera for beginners to ease into the exciting world of DSLR photography and videography; the new EOS Rebel T3 Digital SLR camera. The Rebel T3 is designed to be the camera that can be expertly handled by anyone and allows great-looking photos to be taken with ease and style. The Rebel T3 is excellent in low-light shooting situations and simple to handle and operate." "Putting big imaging power in a small body, the new EOS Rebel T3 DSLR features a 12.2-megapixel Canon CMOS image sensor, a proprietary DIGIC 4 Imaging Processor, a 9-point Autofocus system and a 63-zone dual-layer metering system. With individual pixels measuring roughly 10x larger than a pixel from a point-and-shoot camera sensor, the Rebel T3 is able to absorb more light with less noise, making it ideal for capturing high-quality images in dimly lit situations. The increased efficiencies in gathering light also make the camera better suited to freeze fast-moving objects such as capturing images of children at play at speeds up to 3-frames per second. Compatible with SD, SDHC or new extended capacity SDXC memory cards, the Rebel T3 also shoots 1280x720 HD movies for amazing image quality for both stills and video. The Canon Rebel T3 features an ISO range from 100-6400 for capturing beautiful images in various light settings while also including a built-in pop-up flash. Designed for easy operation through the camera's mode dial, users can go from taking great still images to great video quickly and easily, with simple to understand icons and buttons." I usually start DSLR reviews with a look at the sensor specifications, and a look at the image quality that sensor delivers - in part because I really want to know what the camera can deliver if everything else works properly. I will again follow that agenda in this review. As I said in the Canon EOS Rebel T3i / 600D Review, fast phase-detection autofocus along with excellent image quality (especially in low light) are two of the big drivers for the popularity of Digital SLR cameras. The sensor, processor and processor algorithms form the basis of that image quality. 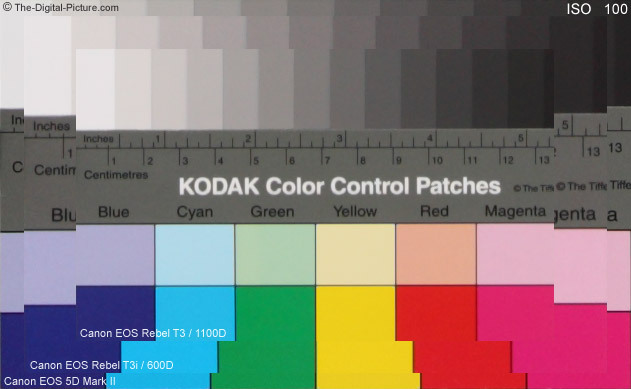 The Canon EOS Rebel T3 / 1100D received a brand new sensor. I asked Canon why the similar resolution XSi/450D's sensor was not used, but that question remains unanswered. As can be seen in the comparison chart below, the T3 sensor is very slightly smaller and has very slightly less resolution than the Rebel XSi. Here is a Canon EOS Rebel T3 vs. EOS Rebel T3i resolution comparison (use the mouseover on that page to see the differences). Many other camera model results are available for comparison on that page as well. While the T3 may have one of the lowest resolution sensors of the current Canon DSLRs, it delivers some of the cleanest high ISO image quality. If you have read any of the site's other recent Canon EOS DSLR camera reviews, you will recognize the following color block test that clearly shows and compares sensor noise. If you read the image quality discussion on that page, you can skip down to the paragraph above the file size table and discussion. The difference in high ISO noise between the T3 and the XSi is big - and may answer my question about why Canon did not use the XSi sensor in the T3. Choosing a new sensor looks like a good decision on Canon's part. The T3 image quality, from a noise perspective, stands up very strongly to all of the other EOS DSLRs exampled here, including the most-recently-released T3i. The T3i and 60D have noticeable resolution advantages over the T3. 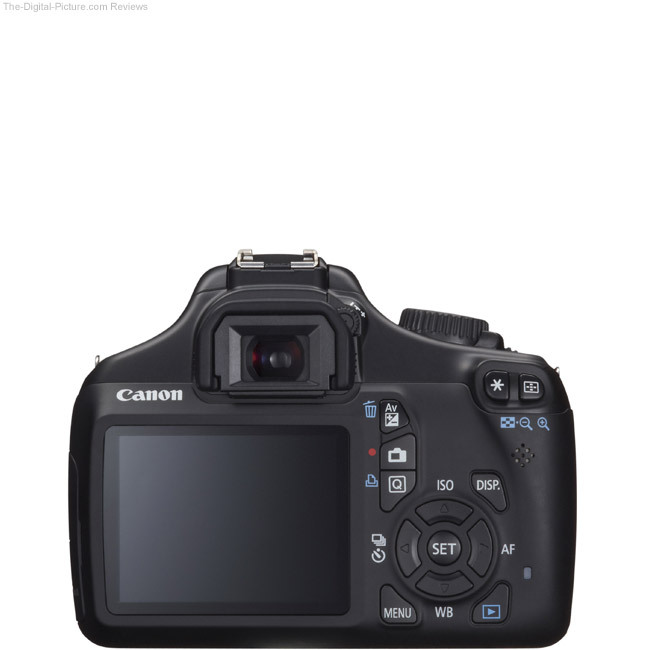 I would definitely prefer the 5D Mark II's image quality, but the 5D II is in a different price league. The T3 does not have ISO 12800 available as many of the higher grade models, but I rarely find myself using ISO 12800 anyway. I don't miss it in the T3. Comparing the image quality between cameras without noise reduction enabled shows what the cameras are capable of without the help of software algorithms. Newer DSLRs have better in-camera noise reduction routines, but I continue to keep it turned off in my cameras. I sometimes enable noise reduction during post processing, but I tend to go light on the reduction settings - due to the loss of detail that accompanies it. The bottom example above demonstrates noise reduction with NR amounts ranging from 1,2 (Luminance,Chrominance) at ISO 100 up to 7,14 at ISO 6400. Fine details better-hide high ISO noise - and highlight resolution differences. The fabric example includes such fine details. Note that the T3 examples with noise reduction lose nearly all thread detail at ISO 3200. The T3 uses SD/SDHC/SDXC cards for storage. Use the figures above to get a rough estimate of the size card you need. Of course, the JPG file format is significantly more storage-space-efficient and has various levels of image quality/compression that also adjust space requirements downward dramatically. My advice is to shoot RAW and buy lots of memory. Memory is cheap - buy enough to use for temporary archiving and backup. Overall, the T3's resolution is on the low side for what is available from Canon today, but its image quality is still impressive. The image quality relative to the price of the camera is quite strong. Blatantly missing on the T3 is the self-cleaning sensor feature found on all other recently introduced models. I regard hate as a strong word, but I can honestly say that I hate sensor dust and appreciate all features available to eradicate it. The T3's metering system has been working fine for me - especially fine for the price of the camera. Evaluative metering (linkable to all AF point), Partial metering (approx. 10% of viewfinder at center) and Center-weighted average metering are available with spot metering remaining absent. As I've said before, I use AWB more and more frequently with Canon's EOS bodies. Unlike the older EOS cameras, the T3's AWB handles tungsten light color (strong reds) very well. Lacking is the f/2.8 high precision center AF point feature found in the T3i. As usual for Canon's non-1-Series bodies, the T3 requires a lens with a maximum aperture of at least f/5.6 or wider (as reported by the lens) for AF to function. In One Shot AF mode, the T3 is turning in the normal/good accuracy I've come to expect from an EOS Rebel camera. In AI Servo mode, all Canon DSLRs attempt to predictively focus the attached lens at the precise location the subject will be at the moment the shutter opens. This is the mode where I see camera capabilities differ most dramatically in - the T3 is not the camera I would select for capturing action rapidly approaching (or departing) at close distances. While the T3 has contrast AF available in Live View mode, you will not get the fast DSLR phase detection AF speeds using it. So, if you are using AF, you are likely using the viewfinder. DSLR viewfinders are nice relative to point & shoot camera viewfinders (if they even have one), but the T3 viewfinder is very small - even noticeably smaller than the T3i viewfinder (which is also small). Placing a T3 and T3i to each eye simultaneously shows that the T3i viewfinder is noticeably larger. Viewfinder size is all about what you are used to, but the T3 has a small body size with a small pentamirror (not pentaprism) viewfinder to match it. Mirrorless cameras have been getting a lot of press recently - for their small sans-viewfinder size. The T3 is obviously not a mirrorless DSLR, but the small viewfinder mounted on a small camera gives the Rebel T3 an overall still-small, very easy to take with you, size. And having a usable viewfinder is a huge asset. As mentioned, the T3i viewfinder provides 95% coverage. You are going to have a little more subject in your image than you see in the viewfinder. I seldom hear people complaining about this - you quickly get used to it. But you might need to crop out something unintentionally present in your image during post processing if you are not careful. The T3's LCD is one of the obvious corners cut to achieve the entry-level price point. The relatively small (2.7"), low resolution (230,000 dots) LCD is usable, but is very difficult to see in bright sunlight. The T3i's 3", 1.04 million dot, 3:2 ratio, vari-angle LCD is a strong feature advantage it holds. 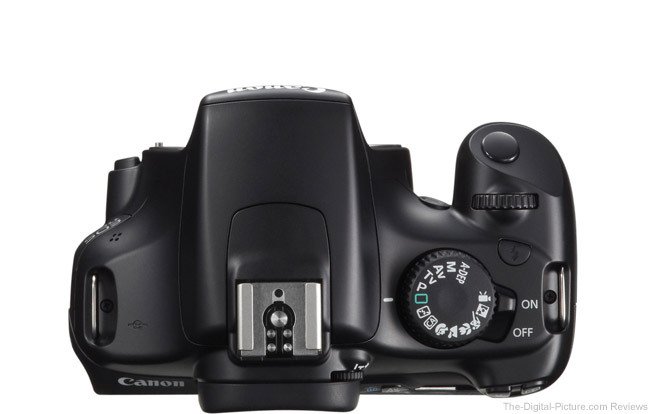 To be honest, I'm growing weary of Canon's EOS bodies all having different button layouts. Because I use so many different models, I'm never sure about the function button locations on any of them (except my primary 1Ds III bodies). I don't have significant problems with the layout chosen for any of these cameras - they all seem logical. And if you are only shooting with one model, these differences are of little consequence to you. Buttons provided are logically located and control the most-used functions. The dedicated Live View & Video Start/Stop button is convenient to have but not easy to find without looking - there is little "feel" difference between it and the "Q" button positioned immediately below it. Press the "Q" and navigate an LCD full of settings using the Cross Keys. When the setting you want to change is selected, press Set and make the change desired. Cross Keys continue to be used to specify setting changes to be made or to make changes to a previously-specified setting. While not as fast to use as the Rear Control Dial found on the higher-end EOS models, the Cross Keys are logical and easy to use. To make life easier for novices, Canon has included a new EOS Feature Guide with an enhanced Quick Settings Screen that now includes detailed descriptions of camera settings. For example, turning the mode button results in a description of that mode being temporarily displayed on the LCD. Users who know camera exposure basics will likely find the Feature Guide to be annoying. Fortunately, we can turn this feature off via a menu option. Canon's menu system is very easy to use. The Rebel T3's main level menu options are nearly identical those of on the Rebel T3i menu (creative filters and resize options are missing - but I don't miss them). Submenu options do differ based on feature differences. I'm still having a hard time with the completely absent mirror lockup function (use Live View instead). ISO Expansion is also missing from the custom functions. Like the rest of the recently-delivered EOS DSLRs, the T3 is a video DSLR. Turn the Mode Dial to Video Mode and press the Live View/Video button to start recording. However, the T3 incorporates a subset of the video features found on these recent DSLRs including the T3i. The T3 records only at 1280x720 resolution (720p) and 30 (29.97) or 25fps. ISO, shutter speed and aperture are set automatically. The T3 includes the usual built-in, get-the-job-done monaural microphone (48kHz sampling frequency, 16-bit, auto levels, no wind filter). A 3.5mm jack for an external stereo microphone is not included. All compatible lenses can be used including Canon EF, EF-S, TS-E and MP-E lenses. Video memory card requirements for video are Speed Class 6 or higher SDHC or SDXC. Recorded file size is limited to 4 GB per video clip and a single video cannot be longer than 29:59. Use Canon's included ZoomBrowser EX software to extract still photos from video files (at 1280x720 resolution of course). DSLRs, with their huge-to-video-camera-standards sensors, deliver impressive video image quality - especially in low light - and more people/companies/businesses are using it every day. The large sensor combined with the huge range of lenses available gives even those on a tight budget the ability to create incredible video projects utilizing shallow DOF and low/available light. DSLRs are not, however, a perfect-for-everyone video package. Recording a quality T3 video requires some forethought. First, AF during video is available but not recommended - even by Canon. The contrast detection AF (using the shutter release button) that is available in video mode is slow and can completely ruin a segment while it tries to find the right focus distance ("focus pulling" is what the pros do). All lens focusing and image stabilization sounds are audibly recorded by the internal mono mic as are the aperture changes made by the auto exposure feature (unless exposure is locked). If zooming or panning in auto-exposure mode, changes in scene brightness will cause undesirable exposure changes in the recorded video. Rolling shutter can be obvious in fast-pans of vertical lines. Put the camera on a tripod, manually focus the lens and life is much better. The quality from the built-in mic is not bad, but without an external mic port, an external recorder is needed for best results. And again, video quality is very high for the 720p resolution. HD video is a very nice and valuable feature added to an already inexpensive DSLR. Getting back to the above camera back view image comparison ... The T3 is a small camera - not much larger than a Canon PowerShot G-Series camera. Small size is great for convenience and portability - and for small hands, but the larger bodies are easier to control - especially with a large lens mounted. I have medium-sized hands and, without a rubber grip surface (as the T3i has), the camera is somewhat hard to hang onto - especially if I am sweating at all. Omitting the rubber grip surface was a mistake - in my opinion. You could probably add you own - perhaps there is room for an accessory Rebel T3 skin. As usual, Canon goes far in trying to make this DSLR easy to use for a beginner, but keeps expert-level controls readily available. The T3/1100D has a total of 14 modes available via the top dial. These modes encompass all needs from fully manual to fully automatic (green square mode) with many preset and creative modes in between. The "CA" (Creative Auto) mode has become a standard inclusion. Creative Auto mode allows the photographer to adjust the shot settings using easily understood words instead of using f/*. * settings and 1/*** time value shutter speeds. These settings are displayed on the rear LCD while adjustments are being made. 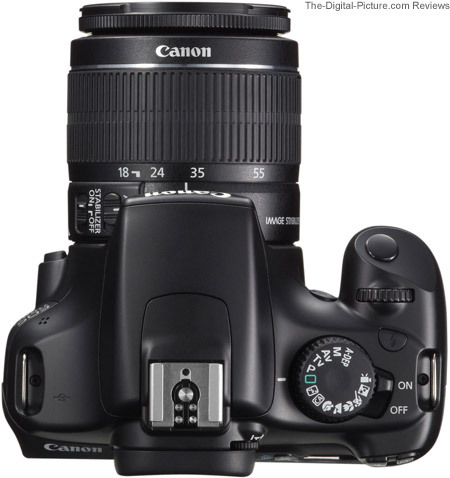 Missing on the T3 is the T3i's upgraded full-auto mode ("A+") incorporating Canon's "Scene Intelligent Auto technology". The T3 side view does not come with any big revelations. A rubber port cover hides a remote release port (not an N3 type), USB port and HDMI port. Small size and light weight are primary characteristics of the entire EOS Rebel/***D series DSLRs. The Rebel series is not built as well as the **D series, but it still has a solid feel to it. The lack of rubber on the plastic grip surface definitely creates a cheaper feel to the grip. Also lacking rubber is the new neck strap. The T3 strap has only about 6.5" of rubberized backing in center (instead of entire strap). Though I don't find the change to be of significance, the floppiness of the strap results in a lower quality feel. The entry level line of EOS DSLRs trails the rest of the EOS line in regards to speed-related performance. Only the Rebel XS / 1000D has a slower frame rate - and the T3 also lags behind in the shutter lag competition. A point and shoot user taking their first pictures with the Canon EOS Rebel T3 / 1100D will think that it is fast, but those used to a 1-Series body will think the T3 feels painfully sluggish and that RAW buffer is inadequate. While this impression is based on user experience, the truth is that the Rebel cameras are not the ideal camera for capturing critical fast action due to the relative slowness of the shutter and the relatively slow frame rate. To test burst rate, I shoot in M mode (wide open aperture, 1/4000 shutter speed - the T3's max), ISO 100, MF, IS off, lens cap on, and all noise reduction off. Testing this way delivers a 5 shot RAW burst in 2.34 seconds or 2.13 fps. Additional frames are captured each 1.35 seconds later. I can fill this buffer even in single shot mode. The Rebel T3 has a quiet shutter sound to go with its discrete size. Here are the MP3 clips. The T3 uses a new battery - the Canon LP-E10 Battery Pack. The LC-E10 charger shows a propensity to get lost - just sayin. Canon rates the LP-E10 + T3 combination at a very respectable 800 shots (700 w/ flash). Like the T3i, the T3 tracks 4 levels of battery charge on the rear LCD. No Canon Battery Grip is available for the T3. Unlike the T3i, the T3 is not compatible with the Canon wireless remotes. The wired Canon RS-60E3 Remote Switch is the Canon remote switch option. Obvious from the picture above, the T3 has a built-in flash - like all of the Rebel models before it. It is important to note that, unlike the T3i, the T3 does not have an Integrated Speedlite Transmitter. You cannot control remote Canon flashes without an external flash controller (such as the Canon 580EX II Flash and Canon ST-E2 Speedlite Transmitter). The T3's flash max X-Sync shutter speed is 1/200 sec. As always, when you buy a Canon DSLR, you are buying into an incredible family of lenses and other accessories. The camera body is of course the base and a lens is the other essential piece of kit. The T3 is, at review time, available only in a kit with the Canon EF-S 18-55mm f/3.5-5.6 IS II Lens. The 18-55 IS II kit lens is decent and is a good value when purchased in the kit. Because the quality of the lens makes such a big difference in the image quality delivered by a DSLR (even the lowest DSLR model), I strongly recommend buying (now or later), one of the better Canon general purpose lenses available. As of review time, the Canon EF-S 17-55mm f/2.8 IS USM Lens and Canon EF-S 15-85mm f/3.5-5.6 IS USM Len are my most-recommended general purpose APS-C/1.6x lenses with the full-frame-compatible Canon EF 24-105mm f/4 L IS USM Lens and Canon EF 24-70mm f/2.8 L USM Lens being excellent alternatives. The product support provided by Canon USA is excellent (I have no experience with the other Canon regional companies). When I call for support, I get an intelligent person who sincerely wants to help me with whatever my question or problem is. Repair service, though I have seldom needed it, is fast and reliable. I do not attempt to cover every feature available in my DSLR reviews - there are simply too many available features to cover in reasonably-sized review. For complete information, I recommend the owner's manual. The full owner's manual is 292 pages long. The paper version comes in the box, the digital version is linked for download at the end of this review. If you bring a T3 home to live with you, read this manual - then go use your camera and read the manual again. The manual will tell you all about features such as Highlight Tone Priority, Auto Lighting Optimizer, Long Exposure Noise Reduction, High ISO Noise Reduction, Peripheral Illumination Correction ... and many, many other topics. Who is the T3/1100D for? The Canon EOS Rebel T3 / 1100D is for everyone that wants great Canon DSLR image quality but cannot spend more than the low T3 price tag. The T3 is a great option for your child's entry into the world of DSLR photography - which leads to a great way to spend family time together - sharing your passion with your kids. Your kids learn a useful life skill while spending quality time with you. 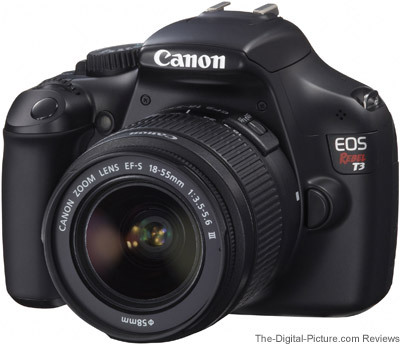 If your budget allows, I highly recommend stepping up to at least the Canon EOS Rebel T3i / 600D. Some additional/enhanced features that easily make this upgrade worthwhile are: higher resolution sensor, better and articulating rear LCD, self-cleaning sensor, larger viewfinder, faster frame rate, better grip, better video quality and video features, built-in remote speedlite controller, mirror lockup feature, spot metering, a modestly better AF system ... The T3's advantages are a longer battery life and a lower price. 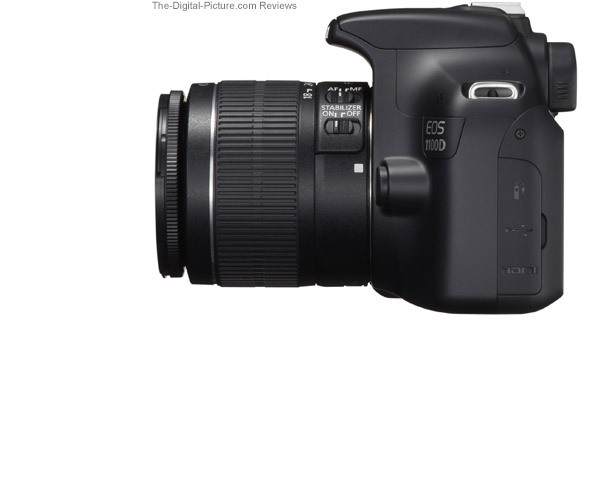 Those wishing to consider an even more capable camera should next read the Canon EOS 60D DSLR Review. The EOS 60D is currently the next step up from the T3i in Canon DSLR performance. Some of the 60D's advantages include a larger viewfinder (pentaprism vs. pentamirror), larger grip, longer battery life, rear control dial, top LCD, shorter shutter lag, faster frame rate with a deeper buffer, faster shutter speed (1/8000 vs. 1/4000), faster max flash synch shutter speed (X-synch = 1/250 vs. 1/200), finer ISO setting control (1/3 stop vs. 1 stop), better AF system (still 9 points, but all are cross-type on the 60D vs. only the center point on the T3), spot metering, horizon level ... The modestly larger size and weight of the 60D will not be seen as a benefit to everyone. To sum up the Canon EOS Rebel T3 / 1100D review: The T3 is as an entry-level DSLR with basic features and very good image quality (especially at high ISO settings). The big news is the low price.